(LWI) - The Salvadoran cross created for the Joint Catholic-Lutheran Commemoration of the Reformation in Lund 2016 was placed in the chapel of the Ecumenical Center in Geneva, Switzerland, in a dedication service on 18 January 2018. The cross, a symbol of this milestone in ecumenical relations, will be accessible to visitors and pilgrims in a place significant for the ecumenical movement. The cross is rich with symbols, and shows a baptismal font, branches of the true vine, and Jesus inviting people of all nations to share bread and wine. “The cross expressed visually that we are on the way from the baptism, which is already common to both of us, to the eucharist which we long to celebrate together and towards which we must take further steps,” said Kurt Cardinal Koch, president of the Pontifical Council for the Promotion of Christian Unity. He preached together with Rev. Dr Kaisamari Hintikka, Assistant General Secretary for Ecumenical relations in The Lutheran World Federation (LWF), on 2 Corinthians 5.14-20. In their sermons, both emphasized reconciliation as a biblical calling. “When we receive the gift of reconciliation from God, we are also called and obligated to proclaim God’s reconciliation and to work for reconciliation, with the authorisation of Jesus Christ himself,” Cardinal Koch said. “The further we journeyed together towards and during the anniversary in prayer and in very concrete planning, the more we became aware of that ‘all this is from God’”, Rev Hintikka said, calling the 50 years of Lutheran-Catholic dialogue a “deeply spiritual journey” that reached a high point in the Joint Commemoration in Lund, Sweden. “We have deepened our mutual commitment to continue together in prayer and joint witness. Today we can look at this journey with gratitude. The Holy Spirit has moved us closer to one-another, Christ continues to call us to move on, together”, she added. On 31 October 2016, LWF President Bishop Dr Munib A. Younan and General Secretary Rev. Dr Martin Junge jointly with Pope Francis led the service to commemorate the 500th anniversary of the Reformation in Lund Cathedral, Sweden. 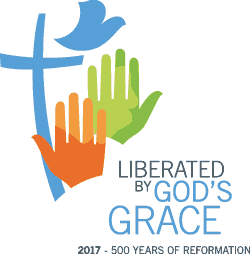 This was a milestone in the history of Lutheran-Catholic relations and in the ecumenical movement. The Lund Cross was painted the Lutheran artist Christian Chavarría Ayala from El Salvador in the typical colorful style of his country. “People create crosses from their own experiences,” said the artist, who as a child lived through the Salvadoran civil war and grew up in a refugee camp in Honduras. “In El Salvador, the cross has always been a sign of hope in our struggles, a sign of faith in our despair, a sign of love in our suffering, a sign of life among the death,” Chavarría adds. The wooden cross is two meters tall, the largest the artist has created so far. “May [this cross] be a sign of hope that we share as we leave behind our conflict, and turn towards our common future,” the Rev. Dr Martin Junge, General Secretary of the Lutheran World Federation (LWF), said in the dedication prayer.